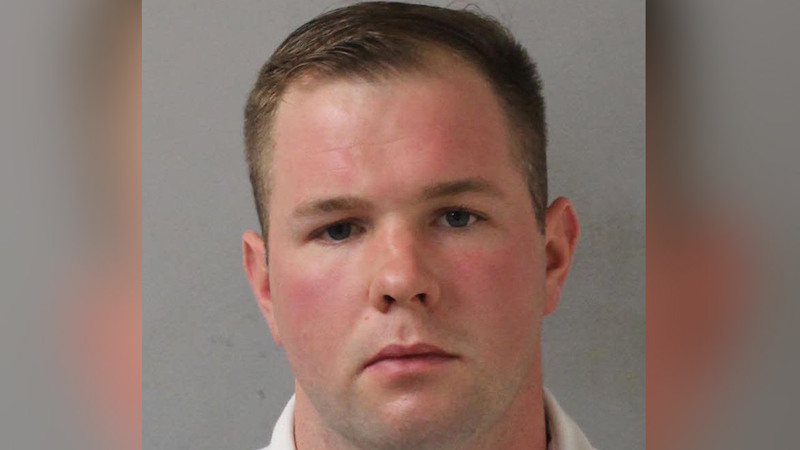 NASHVILLE, Tennessee (WABC) -- A New York City police officer surrendered to authorities in Nashville, Tennessee, Tuesday on charges of felony aggravated burglary and misdemeanor assault. The charges against Michael Reynolds, of Manhattan North, stem from an incident in early July when Reynolds was staying at an Airbnb in a popular Nashville neighborhood. Conese Halliburton, who lived near the Airbnb where Reynolds was staying, accused the 24-year-old of breaking into her home in the middle of the night while he was drunk, then threatening her family and using racial slurs. Some of the exchange was captured on surveillance cameras in the neighborhood. Eyewitness News obtained exclusive surveillance video from ABC affiliate WKRN that captures a man's voice shouting, "Try to shoot me, I'll break every bone in your (expletive) neck. You (expletive) (expletive)." Reynolds is being held in Hill Detention Center in downtown Nashville while awaiting trial. The NYPD has suspended Officer Reynolds without pay. His bond has been set at $1,500. When Eyewitness News first reported the accusations against Reynolds in August, an NYPD spokesperson said Reynolds' duty status had not changed while the NYPD awaited the results of Nashville's investigation, adding that the NYPD had launched an internal investigation of its own.